A portable bidet is a great way to solve the problem of storing 2,000 cases of toilet paper in your long-term storage. You can also use this bidet for camping, backpacking, or in your 72-hour kit. Use the peri bottle to wash yourself. The water should do most of the cleaning. If necessary, the sponge can be used to scrub. The sponge is included with this toilet paper kit because it's compact and dries quickly. If you didn’t have much room and needed to take some kind of toilet paper with you, a sponge could easily fit into your pocket. Make sure to wash the sponge with soap and water between each use. 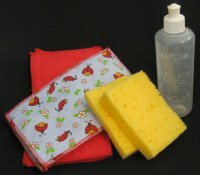 The Flannel wipes are included for drying yourself after you’ve washed yourself with water. Everyone in our family has their own unique emergency bidet kit. I don’t think this is the kind of thing I want to share. Note: Flannel prints vary. When you order several kits together, each kit will have a unique flannel print. Sixteen double-layered flannel sheets. The edges have been surged. Each sheet is approximately 4 ½" wide x 6½-7½" long. What do you do with the soiled flannel wipes? This is where a soaking bucket comes in handy. 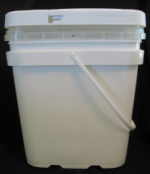 Each soaking bucket is made up of: a 1-gallon bucket (white or clear), a 2-gallon bucket, and a lid. The smaller bucket fits inside the larger bucket. Store your clean items in the top bucket and soak your soiled items in the bottom bucket. For an expanded view of the soaking bucket, see the picture at the top of this page. People have absolutely loved these soaking buckets. What a solution! Also use the soaking bucket to store your feminine hygiene products.